Do you want to improve your advertising revenue? You can do it yourself. Try different ad sizes from different ad networks on different locations for different visitors. Try a lot of ad combinations and layouts. But it will perhaps take months before you can figure out what’s working best for you. Better you let a managed ad network manage your ad inventory so that it can do thousands of testing and experiments for you to optimize your earning. 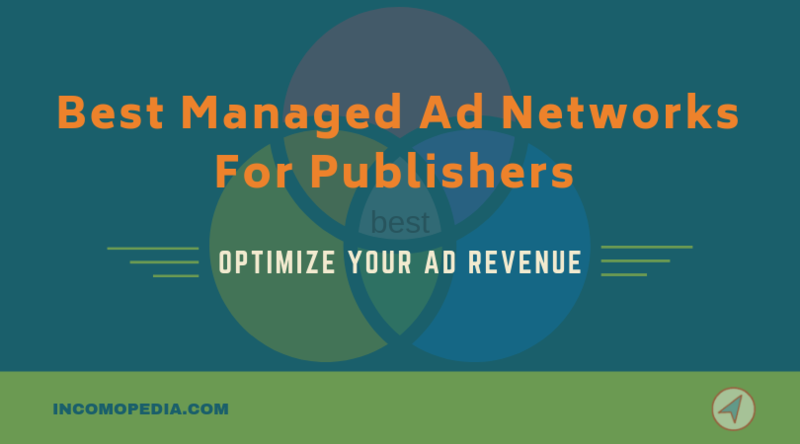 If you are still using ordinary ad network on your blog then you probably are missing extra revenue an ad optimization network can bring you with the same traffic. How Managed Ad Network Increases Ad Revenue? Every website is different and needs a customized strategy based on revenue expectations and user experience goals. A managed Ad Network works as your Ad Manager and represent your ad inventory to advertisers on your behalf. For the first few days, their system learns about your website like what visitors like and dislike, layout of the website etc and collects data. Potential ad spaces are identified. They do a lot of experiments and A/B tests to find out what size and format of ad is working best for a potential ad spot. Their system decides what format of ads to show, when to show and where to show every time a visitor lands on your website. A lot of their partner advertisers bid for your ad spots. Highest bidder qualifies to serve his ads on your ad spaces. This process makes sure you get highest paying ads for your ad inventory. As you get older with an ad optimization company, your earning per thousands visitors keeps improving and you get best out of your blog. Ad optimization networks not only work to improve your earning but also take care of some other very important aspects of your website like improving user experience, website speed and SEO. One of the best thing about using ad management company is that you can focus on creating content by forgetting about optimizing your ad revenue using so many ad networks. Ezoic is one of the best revenue optimizing ad network I have tried. Getting started with Ezoic might take some time but once you are in you will see some great improvements in your revenue. Most publishers earn 50% more revenue with Ezoic than a regular ad network. You can create placeholders for various position on you blog. A Placeholder is a potential ad space where an ad can be shown. Various advertisers fight for your ad space to show their ad. Highest paying advertiser qualifies and you get best ad rates for your ad inventory. This way the Ezoic Ad Tester tool allows you to easily and effectively test hundreds of ad combinations on your blog. Ezoic not only optimize ad revenue but also improve user experience. They use EPMV instead of CPM or CPC. EPMV is earning per 1000 visitors. EPMV keeps improving over the time. Payments are processed at the end of every month. Payout Options – PayPal, Check, Direct Deposit and Wire Transfer via Payoneer. Adthrive is Google’s Certified publishing partner helping publishers increase their advertising revenue since 2013. It is popular ad management network and every website that has ever joined Adthrive has made more money with advertisement than it was making earlier. Average site makes 3 times more per pageview and 50% websites have doubled their advertising revenue with Adthrive. Most of your traffic should be US based in order to be get approved. Adthrive shares 75% of the revenue to its publishers. Payments are processed on 15th of every month. Mediavine is publisher-turned-full service ad management platform and still running a lot of their own blogs. Since they has been publishers, they understand what a publisher needs more better. They keep testing ad solutions on their own websites and working with some top exchanges and ad networks. Mediavine is currently helping 4500+ publishers increase their revenue. They not only increase advertising revenue but also brings publishers more opportunities like sponsored posts. Payments are processed on 5th of every month. They share 75% of the revenue with their publishers. Once they are your ad manager, you can focus on creating good content. Sites with traffic from USA, Canada, United Kingdom and Australia are more likely to get accepted. Conclusion – An Ad management company lets publisher focus on creating quality content by taking care of monetization thing. Some comes up with a lot of additional paid tools you can use for free. If you are struggling with low RPM, you can give them access to your ad inventory. Don’t forget to share your experiences and stories with ad networks via comment box below.